"This was written before the #Jan25 revolution from a very short time, I could not post it then for reasons that are clear for everybody but I could not resist the temptation to publish it now when we find Egyptians for the first time heading in anti-Mubarak protests at the Presidential palace itself. Numbers of anti-Mubarak protesters are getting bigger as we are speaking currently." If you are in Egypt or Egyptian then most probably that among the forwarded emails you always receive in your inbox that email about Mubarak’s presidential palace, the email for sure was full of photos that would wow anyone. “It is also a hot topic in Arabic forums”. 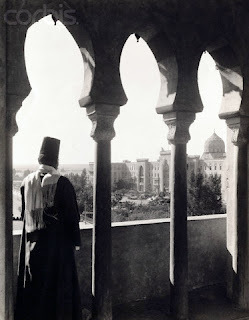 First of these photos are not from the Oroba Palace aka Heliopolis palace, these photos from the Abdeen Palace. The presidential palace and residence in Egypt just like the Egyptian flag changes when the president changes. 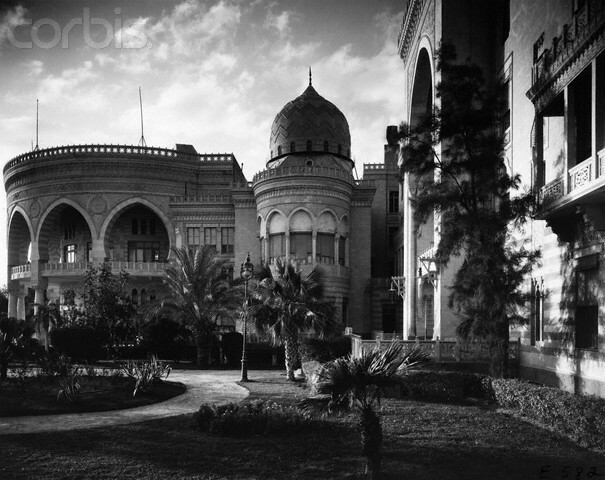 The story of this palace started with the dream of Baron Empain to transfer that desert of Heliopolis into a metropolitan oasis combing this Eastern with Western architectural style to give us the famous Heliopolis style. As a man of vision the famous Baron and his associates in the Cairo electric railways and Heliopolis oases company planned to have that huge hotel in their new city. It was designed by the Baron Empain favorite architects Belgian Ernest Jaspar and French Alexandre Marcel. "The later designed the famous remarkable and legendary palace of the Baron" The biggest names of contractors, electricity supplies and interior designers and suppliers from Europe and Egypt were hired. 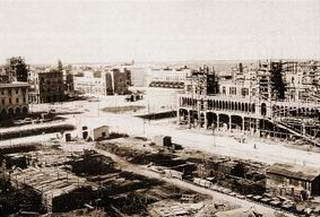 The hotel under construction "Panoramio"
The Heliopolis Palace Hotel was built amazingly in two years between 1908-1910 and do not ask me how. When Heliopolis Palace grand hotel was fully inaugurated in December 1910, it was the most luxurious and biggest hotel in Africa and the Middle East; it was the Hotel Atlantis of its own time with 400 rooms including 55 private apartments. 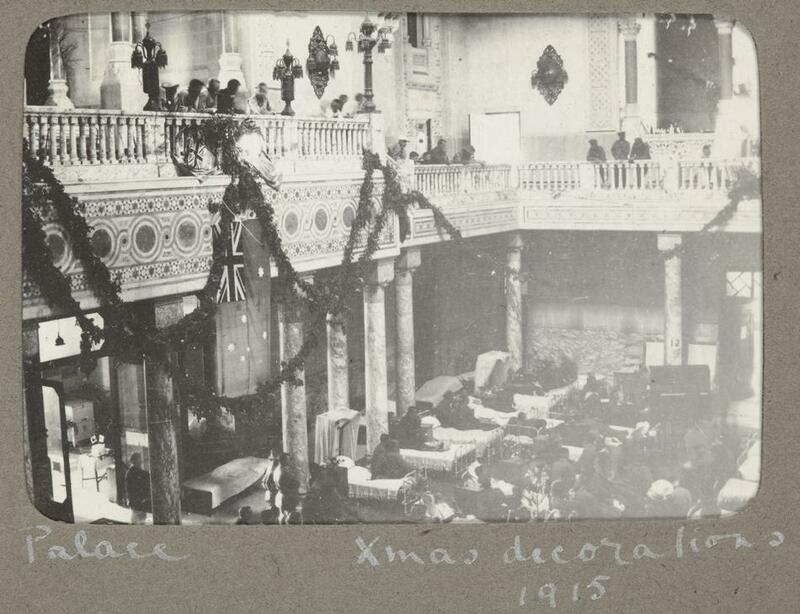 Back to economic facts, The hotel had a French administration following the Baron Empain's company which now has become Heliopolis Company for housing and development. 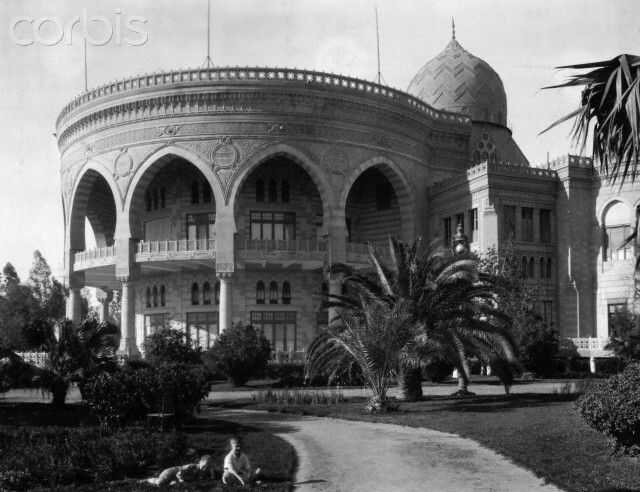 The garden of Heliopolis Palace in 1941 "Corbis"
It was not strange then that its most distinguished guests were from kings, presidents and famous businessmen of their time. 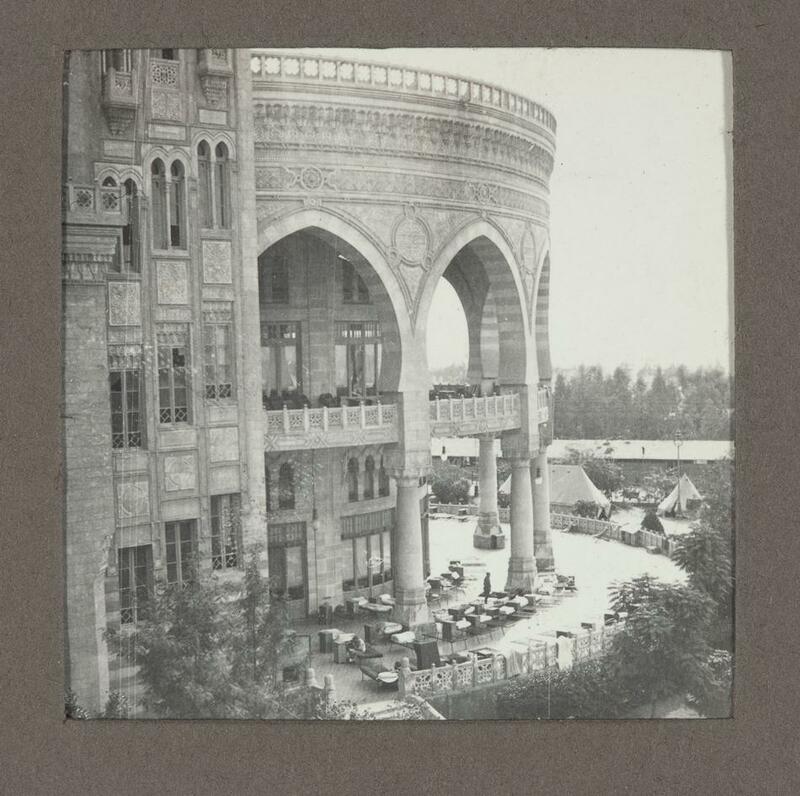 Another shot for the dining room "Islam Taha"
The terrace of Heliopolis Palace "Islam Taha"
Politics played a huge role in the life of that palace, during the WWI and WWII the hotel turned in to a hospital for the British and Australian officers and soldiers. 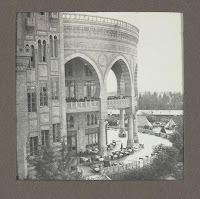 a hospital in WWI "Museum Victoria"
In the 1960s after the nationalization it was used as an HQ for several governmental agencies then in 1971, it became the HQ of the shortly lived federation of Arab Republics. In the early 1980s after restoration works, it became officially the new official presidential palace of the fourth President of Egypt Mohamed Hosni Mubarak. 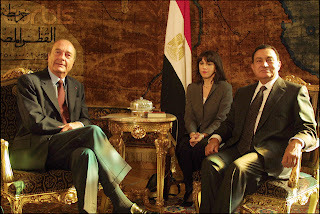 In Abdeen Palace 2005 "Corbis"
All what I think about is that Mubarak does not like staying beside a popular area like Abdeen downtown Cairo. 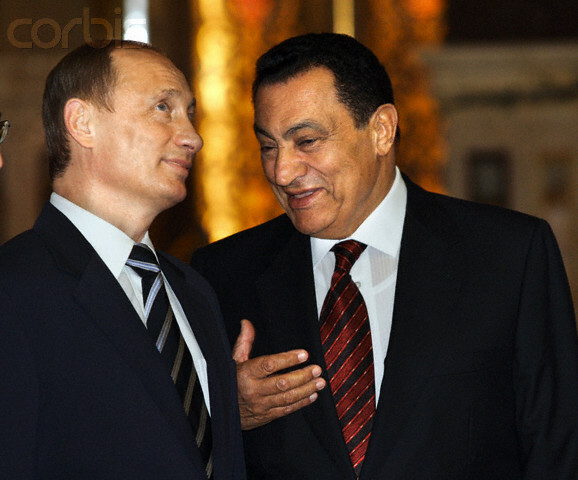 Now Mubarak stays most of the time at the Jolie Ville resort in Sharm El-Sheikh owned by his longtime best friend Hussein Salem. The weather in Sharm for sure is better thousand times than Polluted Cairo and we should not forget that Sharm is too close to Jordan, Saudi Arabia and also Israel just in case !!! 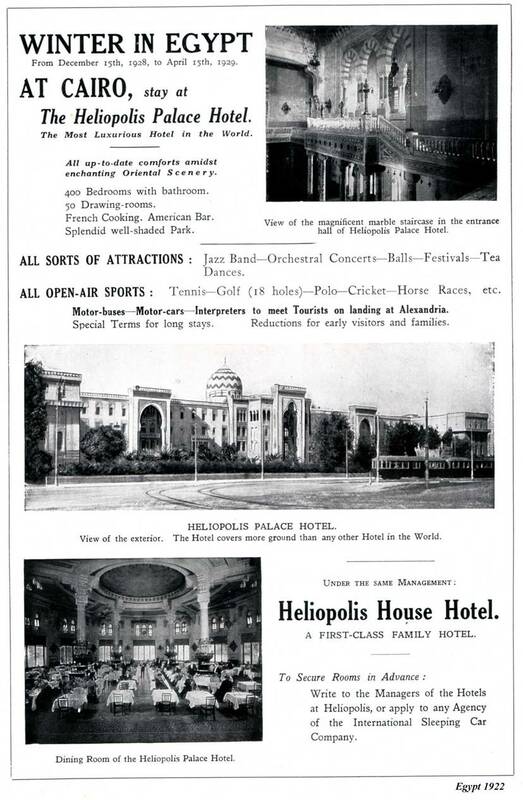 Dear Isaac sent me that wonderful old ad for the Heliopolis Palace from the British press and it made me write this post because honestly, I have not seen any photos for the interiors of Heliopolis palace except the regular photos of that salon and that hall with Egypt’s map carpet. Last year an Israeli journalist wrote a report about his 3 hours that he spent in the Presidential palace of Egypt, of course when you read it, you would feel that it is a huge adventure, as if the man has entered a pharaoh's palace !! I wonder what this journalist's reaction will be if he enters the Abdeen's palace. restoration works and facelift in the past 10 years. Amr El-Barbary, Egyptian interior designer has supervised the facelift of its health club. On May 25, 2008 Ayman Nour wondered in his column in Dostor Newspaper whether Mubarak had bought that palace or not, during that time Mubarak’s brother in law Mounir Thabet hinted in a national TV show that Mubarak bought the presidential residence and became its owner. Nour wondered from where Mubarak got that money to buy that residence as he “Mubarak” comes from a middle-class family and his salary as a president does not allow him to buy a huge palace like that in that area. This is beside the huge fact that according to article no.81 in the constitution the president is not allowed to buy or rent any state property !! There could be a confession because as far as I read Mubarak’s residence is not at the Oroba palace itself“despite it is too big to become a residence” but rather at the villa in front of the Oroba Palace since his appointment as a vice president in 1975 unlike what is common. Already that villa was owned by the Jeweler of King Farouk and has its own legal problems between that jeweler’s heirs and the state last time I checked. If you ask me, I think the Abdeen Palace is enough to become our presidential palace and residence, Presidents and their families should not stay there forever as if it is a family property. The famous round balcony and hall "Corbis"
The interior of Heliopolis Palace "Postcard City"
The Oroba palace should return Heliopolis palace hotel, its location is more than great for tourists and it is not historical like Abdeen Palace, in fact, it was built to be a grand hotel, not a presidential palace or residence. Thanks dear for this enlightening article. I know very little about modern Egyptian history and culture. I had no clue that there were two presidential palaces and the history behind them. I sure hope Mubarak does not have ownership of any palace as it should remain property of Egypt and be a sort of "living" album of the presidential families to come in the future. I enjoy reading your articles, they are well-written. I really appreciate all your efforts in how you work so hard to keep the non-arabic speakers of the world updated. Both Mubarrak and Suleiman are under US pressure itself in considerable pressure from the powerful Lobbies in washington. Do not be fooled by Obamas words, The US is playing hard to get with Mubarak and Suleiman. The aid to Egypt is being used to make Mubarrak and Suleiman think twice before making a decision. Therefore the future of Egypt is being decided right now. Egypt is economically in trouble, also it cannot afford a modern military power without US help, Israel is worried that a democratic governemnt may shift the internal political balance within Egypt and thus we see now great hesitation from Mubarrak and Suleiman as to what to do now. The Egyptian people must be aware that the shots are being called in the US and Israel not just Egypt. 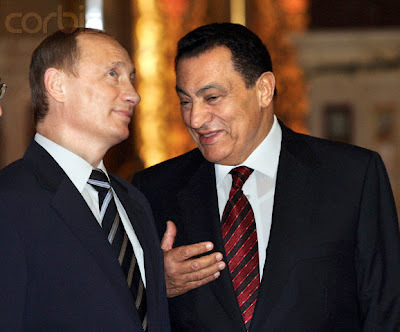 I think Mubarak will be willing to go, but Suleiman will not allow him to go just yet, because without the US support, Egypt will be facing many serious problems, economically and politically. I saw today on AlJazeera Arabic on this topic and according to AlJazeera King Farouk family was forced to sell it to him! am sure the late King Farouk family could explained this. Anyway I think all these palaces should be open to public as a museum and all the late King Farouk treasured should be displayed to the nation and the world to see and the money could maintained the palaces and bring income to the nation just like in Turkey. Investigation should be done by the DA office how simple government workers could stay in all the palaces with their government salary!